Well no, not him exactly, but pretty close. Mike Mignola, creator of Hellboy and artist on books like Batman: Gotham By Gaslight and Cosmic Odyssey, will be returning to HeroesCon this summer! 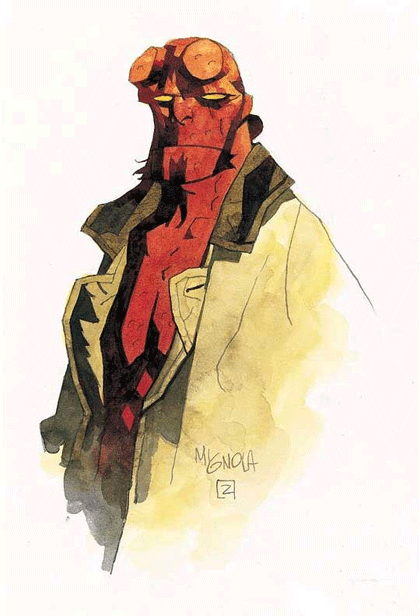 Mike is one of the most respected and influential creators in comics, Hellboy is consistently one of the best and most critically acclaimed comics on the rack. While there are many Mike Mignola duplicators, there’s only one original, and you can meet him in Charlotte this June! Oh man, I just realized–with Guy Davis sitting right next to him, we may need to reinforce the concrete in Artists Alley to make sure the floor can withstand the weight of all those fans. Super exciting news–Shelton’s been working on this for a while; I know he’s extra excited about having Mike back in Charlotte! Oh, wow! Good job you guys. Hooray! Never had the chance to meet him. Guy Davis is a really nice guy; it will be great to have them together at the same con. With all due respect to Jay and his recommendation for Rob Liefeld’s New Mutant’s #98 cover, I say that the above sketch of Hellboy should be the slam-dunk choice as the 2010 3-Day incentive poster. I know that everyone is entitled to their opinion, but I urge Heroes Management to cut through all the red-tape and debate and simply acknowledge that I am correct. It will save countless hours and thousands of innocent lives. Thank you all in advance for giving in so quickly.